Graig Wen camp site is open until early January and Snowdonia has plenty of winter activities. We have hard standing pitches with electric hook ups, the wash blocks are heated and there’s a camp fire area if you fancy a bit of star-gazing in Snowdonia’s designated Dark Skies reserve. So carry on camping! Harlech Castle is open daily. Dogs are welcome in the castle and cafe staff will provide you with a woollen blanket if you want to sit outside on the terrace viewing the wintry Snowdonia mountains over a warming hot chocolate. If it’s wild weather you can head underground at Llechwedd Slate Caverns. Above ground, the Quarry Explorer tour takes you on an off road adventure into the heart of Llechwedd’s man-made mountains in a military 4 x 4 truck. Two people for for the price of one on the Quarry Tour until 25th November 2016. Visit Llechwedd Slate Caverns or Harlech Castle and enjoy 10% off the cost of entry to the other! Caernarfon Castle hosts the dramatic and moving Weeping Window display of Poppies until 20 November 2016. Castell y Bere is one of our favourite places for a winter picnic and walk. Set in one of Snowdonia’s quietest and most beautiful valleys, it is always open and free to get in. You may be coming to walk up Cader Idris – the car park for the Pony Path is under 15 minutes drive from Graig Wen. If you’re looking for a gentler walk, or the clouds are threatening, The Mawddach Trail is right on our doorstep. 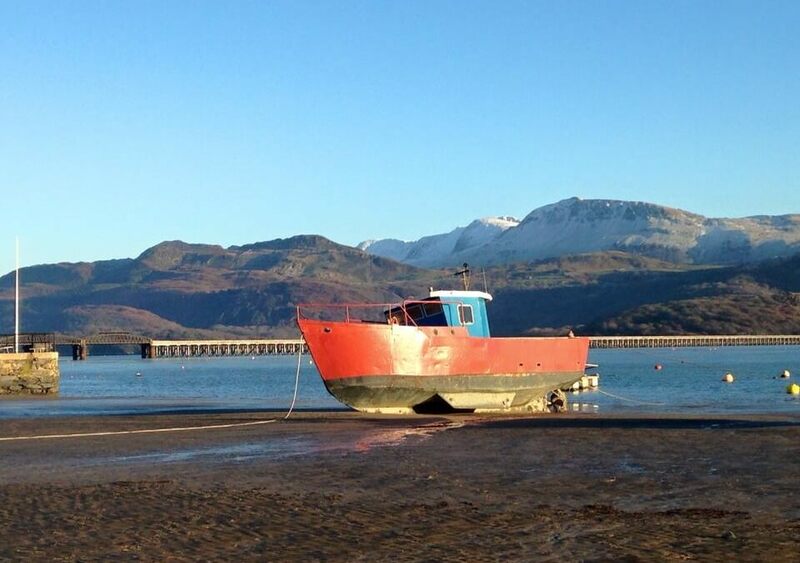 Walk or cycle along the trail over Barmouth’s iconic bridge for fish and chips at the seaside. Sygun Copper Mine is open all year near Beddgelert, a traditional Snowdonia village with a spine-tingling legend at its heart and tea rooms and unusual craft shops to explore. You’ll find plenty of pubs, cafes and shops ready to welcome you inside to warm up. In Dolgellau there’s Meg’s amazing cakes at TH Roberts, a pie and a local pint at The Unicorn, and hearty food at The Royal Ship (all dog friendly). You can hop on a bus there from the camp site if you don’t want to drive (daytime service only). After a walk on the beach at Barmouth you can pop into The Last Inn for a mulled wine, tapas at The Tillman or fish and chips at The Mermaid. Newly opened restaurant “The Bank” serves a mouth-watering Sunday lunch. You can explore quirky independent shops in our small towns and villages – Machynlleth has an excellent and ancient Wednesday Market and there’s free entry to the Museum of Modern Art Wales. Enjoy the coastal views driving to Tywyn for interesting new and second hand book shops to browse or films and live events at the lovely Magic Lantern Cinema if you need to shelter from a wintry shower. In December there’s a choice of steam railways running Santa Specials starting from Saturday 10th December on the Ffestiniog Railway with Fairbourne Railway and Talyllyn running locomotives from 17th December. Many local towns and attractions host late night Christmas shopping events and craft fairs from late November – keep an eye on Graig Wen’s Facebook page for news. Check out our availability for the festive season here at Graig Wen for camping and self-catering cottages. We have a limited number of pitches available on the touring camp site until early January but please call us in advance to reserve a pitch on 01341 250482 or book online. Sign up for our e-news and be the first to hear about special offers, news and exclusive deals. What family memories will you take home? Muddy for Nothing and Sticks for Free! Guest blogger Mireille’s half term holiday tips!